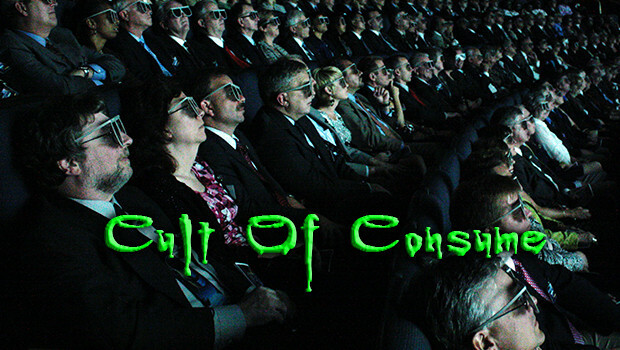 Greetings and welcome to my little dark corner of Need To Consume, THE CULT OF CONSUME. This is where we look beyond the frontline of film, deep into the DVD racks, into the VOD void and around the back into the alleyway of re-releases. This isn’t the place for your blockbuster drudgery. I’m going to be bringing you hidden gems of the cult world, lost classics and certainly some films that have been forgotten for good reason. 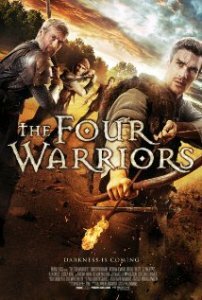 FOUR WARRIORS deftly avoids any kind of real genre, like GAME OF THRONES meets ASSAULT ON PRECINCT 13 meets VAHALLA RISING. It opens with 3 weary warriors returning from the crusades, with a captured Saracen in tow. As they cross the English country, they come across a village terrorized by figures in the mist taking their men and children. Caught between duty, love and a desire to get home, the 3 crusaders (and their friendly local Saracen) decide to stay and fight, to protect the village. From here the film swings from tense hunting scenes to full on sword wielding battles. Whilst a surprising third-act cameo does kind of take the wind out of the sails of the action, the final battle does genuinely feel like it has some heft. Unfortunately the budget limitations are evident at times on the screen. with some sword fights seeming too staged and once the monsters are revealed, their make-up does look it’s cost. That being said, the actors themselves do carry the film, with special mention to Hadrian Howard and Alex Childs for being the stand-out roles. A great fun films, with big aspirations and some compelling leads. 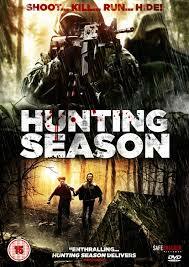 HUNTING SEASON is a great blend of the lost-in-the-wood horror and small-town horror in a really rather compelling film. Telling the tale of two brothers, on the run after accidentally killing the patriarch of a local clan, hunted through the forest by his descendant, taking in local cops, sheriffs and good ol’ boys. The first thing to note is the acting throughout in steller, with particular note going to Spencer Treat Clark and Nick Eversman as the brothers and Ted Levine as their conflicted father. Unfortuneatly, the film suffers in terms of direction, it seems unable to pick a tone for the film, swinging from gritty tense thriller, so odd black comedy with some of the local characters, all undercut with a soundtrack seeming cut out of a HART OF DIXIE season. It leaves you lost as to who to route for but isn’t nuanced enough to make the characters truly morally grey. An interesting premise with great performances, let down by uneven direction. One for genre fans only. Look, I watch a lot of odd films for this article, but THE HAPPINESS OF THE KATAKURIS is hands-down the weirdest one yet. Set in a remote guesthouse in Japan, THE HAPPPINESS OF THE KATAKURIS is the tale of the titular family struggling to make the guesthouse work, whilst dealing with fatal guests, family drama and the crushing on-set of financial ruin. But also it’s a musical. But also large parts of it are surreal claymation flights of fancy. But also parts of it are consciously awful CGI. As I said, weird. But through all of this madness, there is a spirit of fun and care, with even the faux-karaoke sequence endearing the couple to you, for all their flaws. Even a third act zombie scene and the surprising ending just make you smile. And that is it’s charm, the delirious over the-top nature of the film grabs you early and take you on a fantastical ride, all the more surprising given the director’s usual horror fare. The blu-ray is the usual high standard we exepct from Arrow Films and comes crammed to the rafters with commentaries, behind the scenes, trailers and as always comes with a highly researched booklet in the box. Go watch it, take your mind on a trip. Who hasn’t feared the strange knocking noises in the night? Wondered what happened to all those things that go missing? 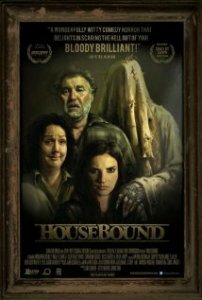 HOUSEBOUND has the answer. HOUSEBOUND is a kiwi comedy of a women, sentenced to months house arrest with her mother, in the home she ran away from as a teenager. Soon, she starts to experience noises in the night, figures at the window and overly creepy hoarder neighbors. Unlike THE HAPPINESS OF THE KATAKURIS where the humor comes from the surrealism of the film, here is it much more in the deadpan New Zealand style, evident in last months WHAT WE DO IN THE SHADOWS or cult classic BRAINDEAD. Morgana O’Reilly stars as Kylie, the woman at the center of the film and is a utter revelation. She pulls off the mix of wide-eyed horror and steely resolve with aplomb. She is equally surrounded with amazing supporting cast, with special mention to Glen-Paul Waru and Ryan Lampp for their roles. This film really nails the balance of horror and comedy with many stand-out scenes putting me on the edge of my seat throughout. A real gem and well worth you time. See it as soon as you can. Ah, the old trope of the killer great white shark and the man sent to stab it in the face…. SHARK KILLER is the tale of one Chase Walker, a world reknown ‘shark killer’ (is that a job? How do you get accreditation there?) called upon by his half-brother to hunt and kill a Great White in Cape Town, a shark that just happens to have eaten a priceless diamond that his brother stole from a local crime lord. Cue plenty of beautiful shots of south africa and heart-felt man posing from the lead, Derek Theler or doe-eyes from Eureka-alumni Erica Cerra. Films like this tend to get lost in the mire of SyFy Mega-Croc-Shark-Monster films, but that would be a real shame. 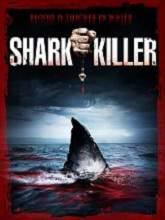 Whilst films like Sharknado are playing at cult status, the knowing wink and nod ruining the film, SHARK KILLER plays itself straight. Theler is channeling his inner Chris Pratt, and whilst he has some of the charm to pull it off, it is hard to manage when we all know someone else out-there is doing the same thing, only better. Cerra is magnetic as always and their budding romance is one of the strong points of the film. Unfortunately the film does fall down in a few key places. Firstly, the shark CGI leaves of a lot be desired, the low-budget being more than evident in the re-use of shots and the low quality of various hero shots. Secondly, and more importantly, this film seems lost as to what tone to follow. It swings wildly from frat-comedy, to gangland thriller, to sun-kissed rom-com to family drama and everything in between, leaving the audience lost as to what to make of it. The charm of the leads do carry you through, but a few less distracting bit-parts and side-plots would serve it better. 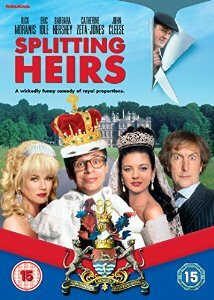 A bit of a oddity on this month’s article, SPLITTING HEIRS is the re-issue of the 1993 Rick Moranis/Eric Idle comedy by Fabulous Films. The film tells the story of Tommy Patel (Idle) who gets in with the brand new 15th Duke of Bournmouth (Moranis) before discovering he is the real Duke and starts to scheme to claim his rightful throne. The film comes very much in the vein of similar UK comedies, like KING RALPH or FIERCE CREATURES, a mixture of slapstick comedy, facial gurning, awkward sexual encounters and John Cleese. It holds it’s own but ultimately is forgettable. Idle is very much the star here, but it great to see Moranis playing against type as the confident and successful Duke who gets the girl. Excellent support from an early Zeta-Jones and the disrtractingly alluring Barbara Hershey with Cleese on good form as always. An enjoyable sunday afternoon yarn, but’s not going to set the world on fire.